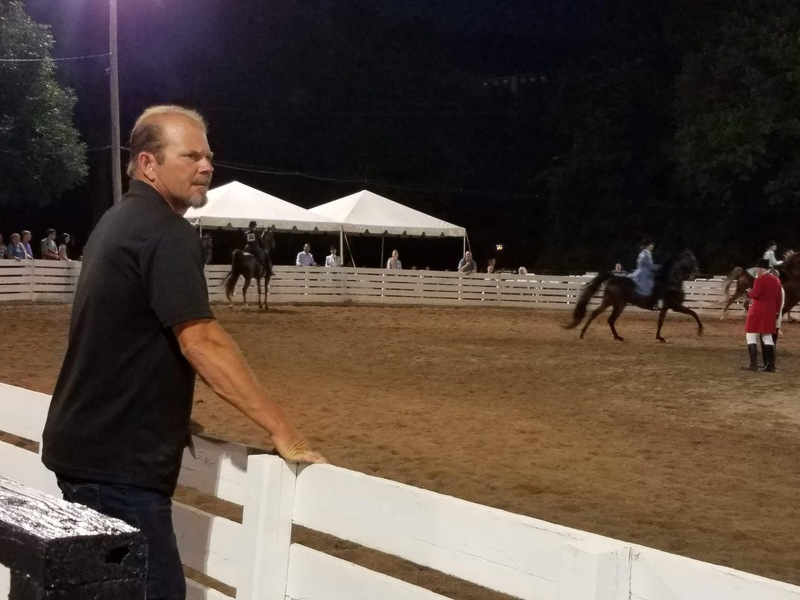 I was deep in horse country — Kentucky — last week, and I stumbled on an event I never attended or paid any attention to when I was growing up in Louisville. 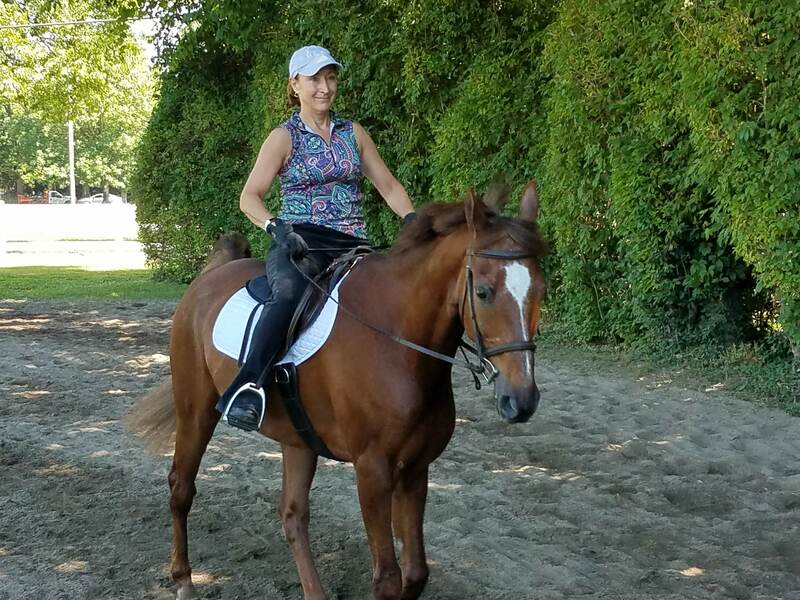 Adjacent to Louisville’s second largest park, Seneca, is a riding club called Rock Creek. The club is next to a widely used section of the park that has baseball diamonds and soccer fields and is encircled by a 1.2-mile walking path. I knew about Rock Creek, but I didn’t know the club held an annual horse show that attracted competitors from far and wide. 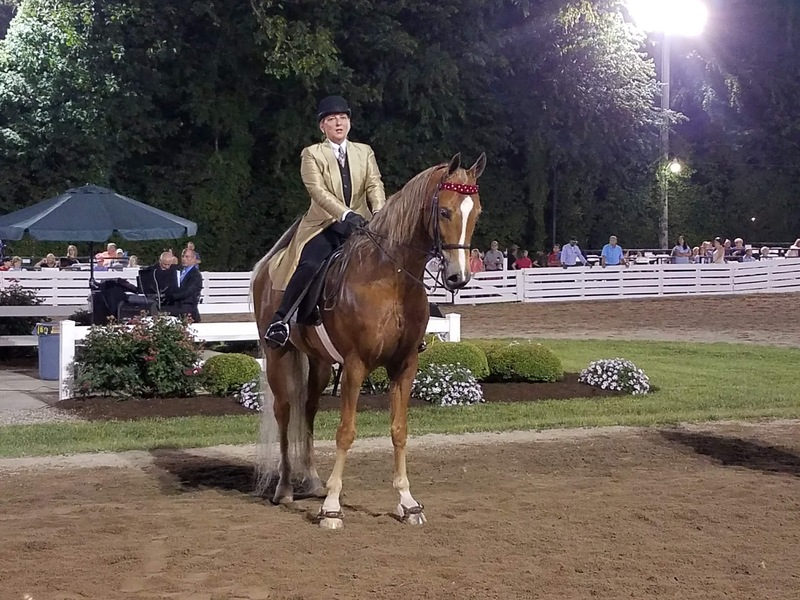 One day while walking on the path, I saw a sign promoting the 2018 Rock Creek Horse Show and that it was scheduled to start last Tuesday night, my last day in Louisville. 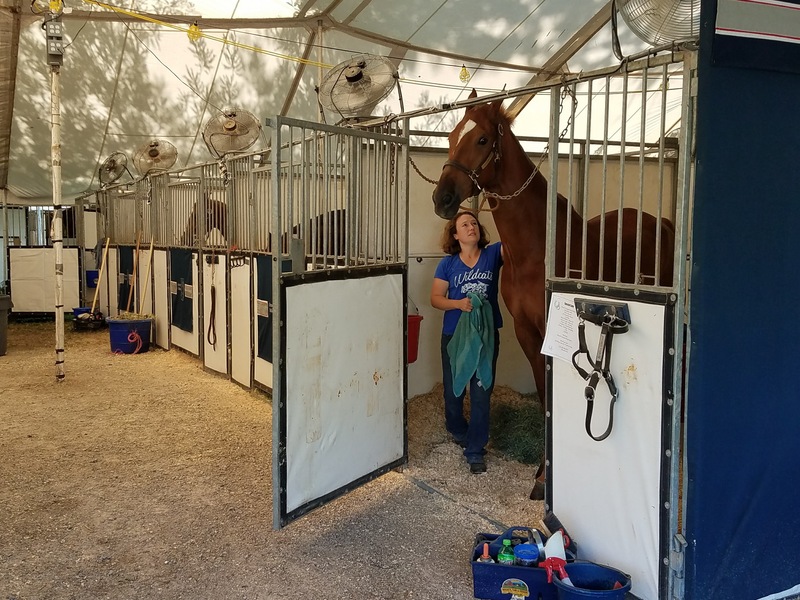 I went back to the club Tuesday morning and took some photos of the build-up to the show, including riders putting their horses through last-minute training sessions. Just outside the ring is a path where riders can walk or cantor their horses. 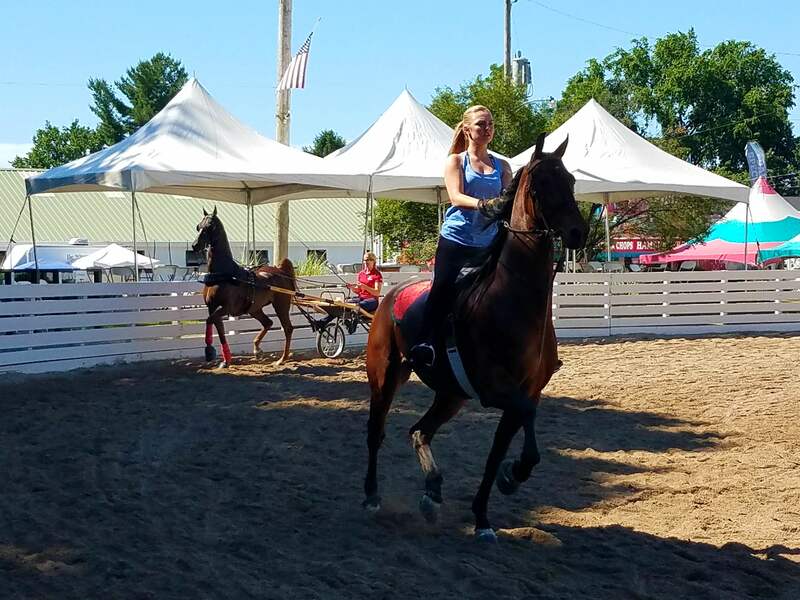 This young woman was putting her horse through its paces inside the ring. Behind her was a horse and driver preparing for the “roadster” competition. 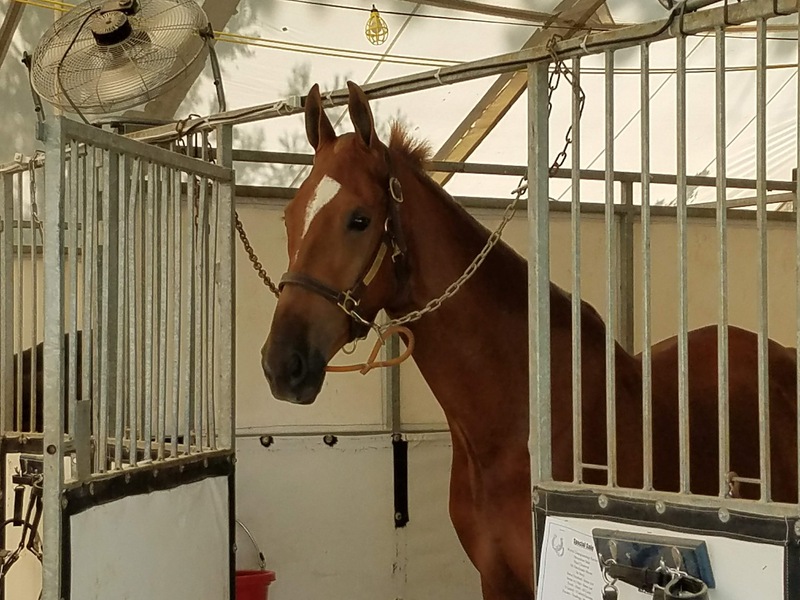 No, this is not Justify — even though the horse resembles the Triple Crown winner with its white blaze. The groomer (maybe owner?) was kind enough to let me take these photos. 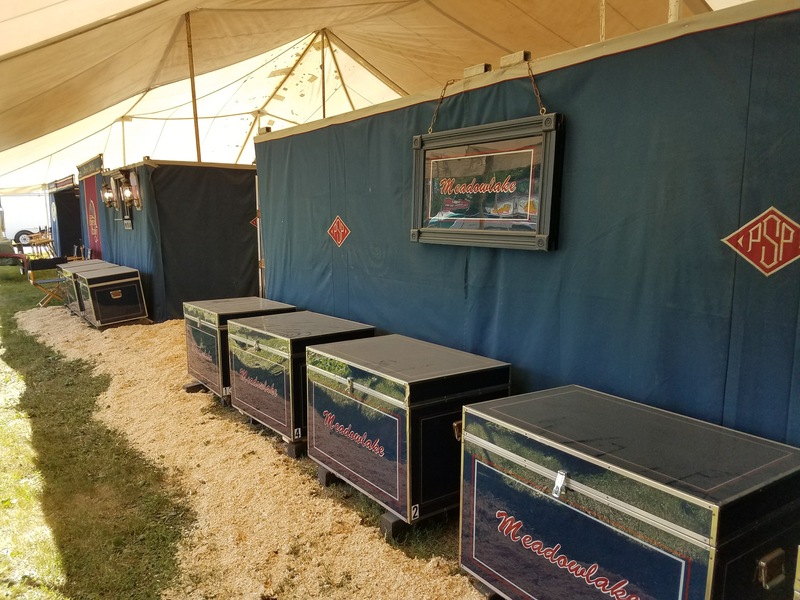 Stables that compete in big-time horse shows haul around a lot of equipment. 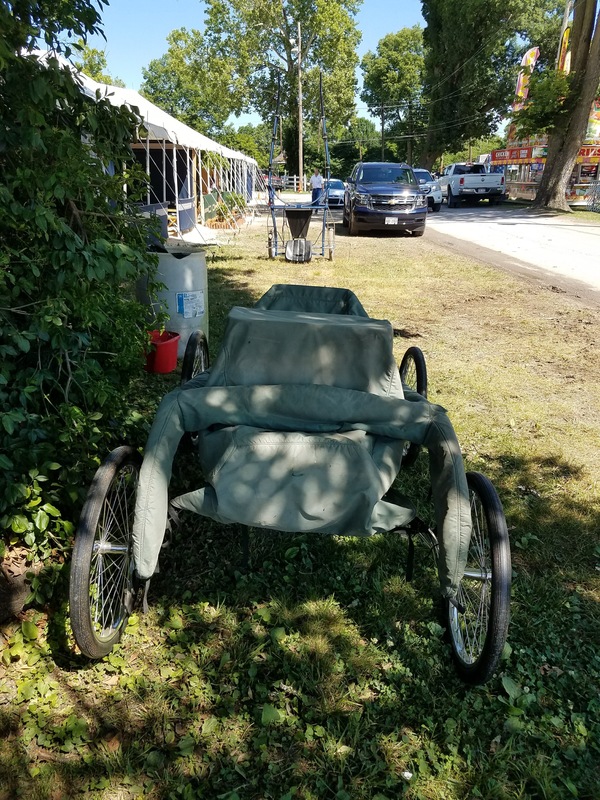 Several buggies were parked on the periphery of the stables. That night, Tuesday, I returned to the club for several categories of competition. 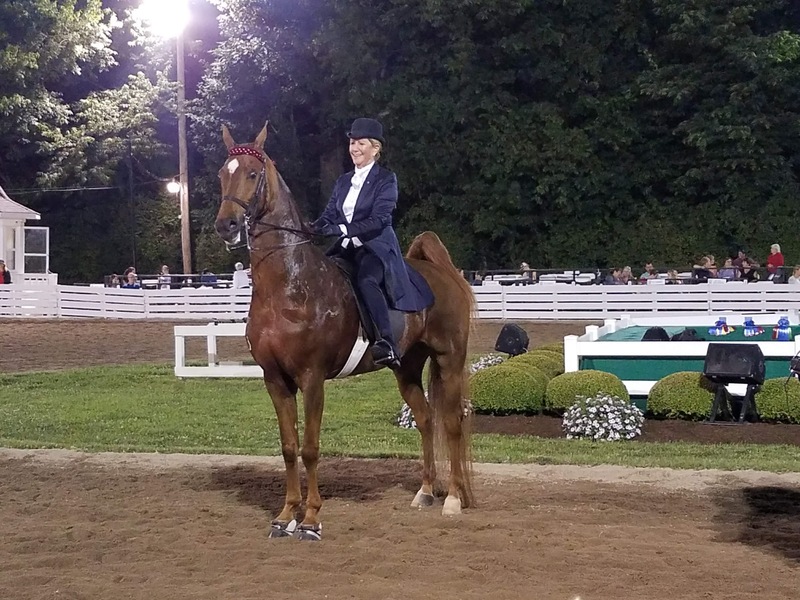 This horse and rider prevailed in one of the gaited categories. This woman participated in same event…The riders face the spectator area while waiting for the results to be announced. 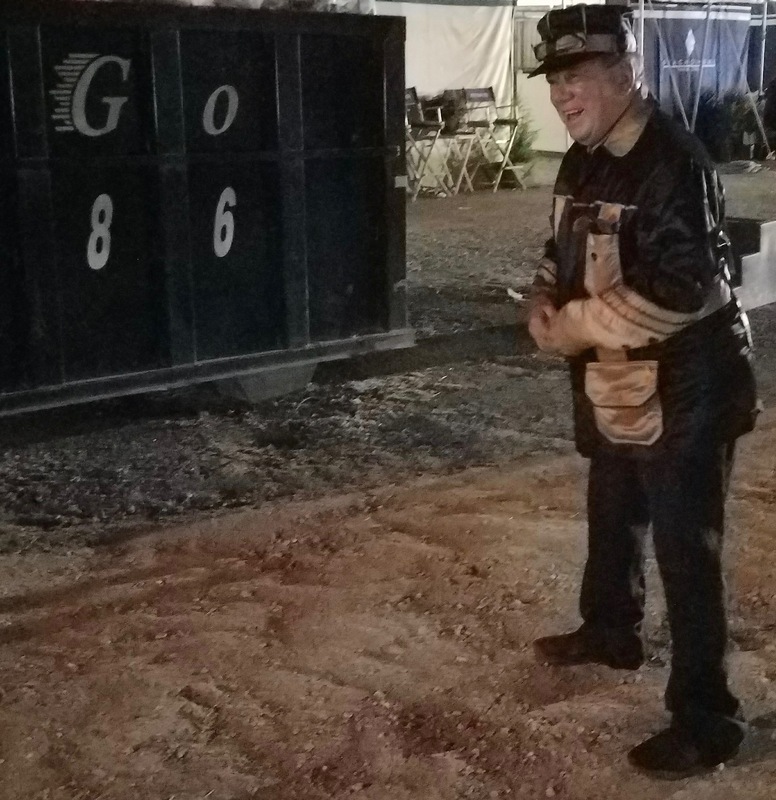 Trainers, like this man, stand outside the rail and call out instructions to the riders of their horses as they pass by the spectators’ boxes. The roadster category was the last event I stayed for, and it yielded a surprise. The drivers wear caps, goggles and colorful outfits. As I watched this event, one driver stood out, mainly because he was significantly older. He was wearing a black outfit with gold trim and a funny-looking cap. The driver looked to be at least my age, and as I watched him, I tried — but couldn’t — envision myself whipping around the ring in the driver’s seat, going what must have been about 25 mph. When the event was over, the show announcer came on the PA system and announced the winner and other top finishers. I knew the winner was the older guy, but either I didn’t hear or pay attention to the man’s name and place of residence the first time the announcer spoke. The words started to sink in…William Shatner…Beverly Hills, California. I thought, William Shatner? Star Trek? Then I thought about that little guy who had whirled by me several times and realized that, yes, that could be William Shatner behind those goggles and under that funny hat. 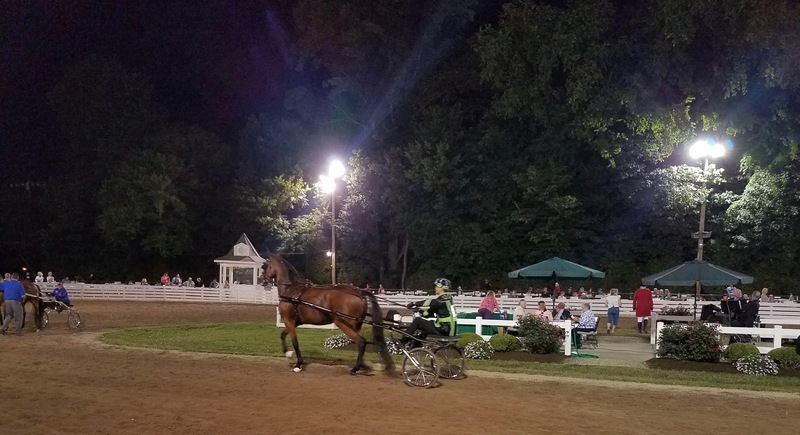 I followed the buggy outside the ring to a darkened area by the stables, where a couple of attendants unhooked the buggy and Shatner stepped out. He glanced at me and said, “I’ve been here a time or two” — in a tone I understood to indicate he had been to the Rock Creek show many times. So, while he stood in the dark, several steps away from a black dumpster, I took his picture. 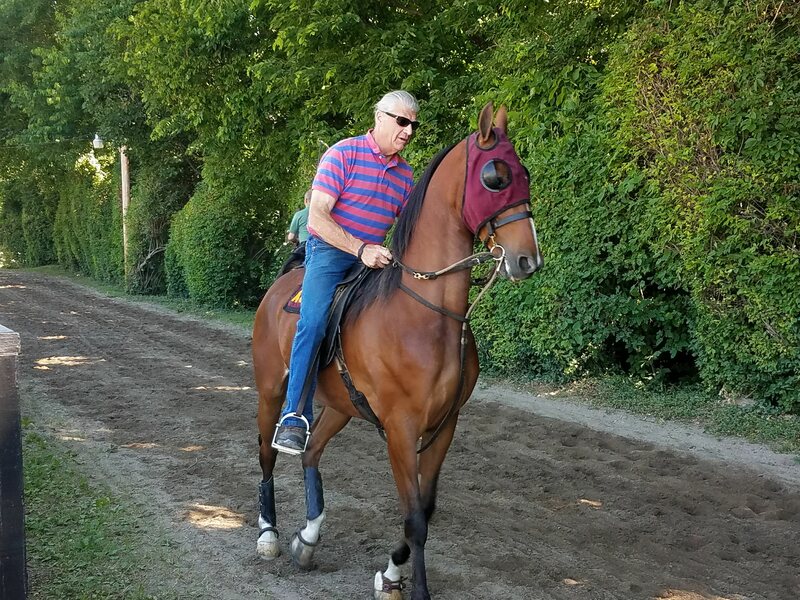 When I got back to my place of lodging, I checked him out on Google, and, sure enough, he breeds, owns and rides saddlebreds. …Here’s the kicker: He’s 87 years old. I remember seeing William Shatner riding in competition at the American Royal 25 years ago or so. Came into town very quietly. Some people in the crowd knew or figured it out and word passed around the area. Sure enough it was Captain Kirk. That shows you how much TV I watch…I’d heard of Boston Legal but didn’t know Shatner was in it. …By the way, Gayle, it is fitting that yours was the 10,000th comment posted on this blog since I started it in March 2010. Wow! My day just turned exciting! Is there a prize? :) I thought the honor would have gone to Altevogt. Re Boston Legal: our local cable company has deemed us worthy of three weeks of free extra channels and BL happens to be on one of them.